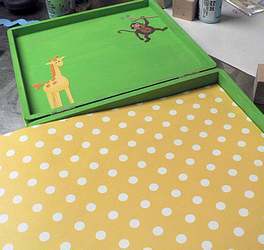 Create an adorable and affordable baby memory box with this simple tutorial! 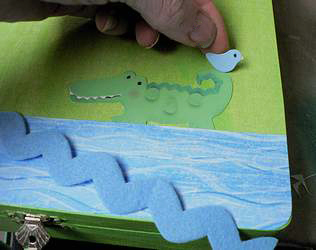 Make this adorable baby memory box to hang in baby's nursery. Or create one to give. . . it's a unique homemade baby shower gift! 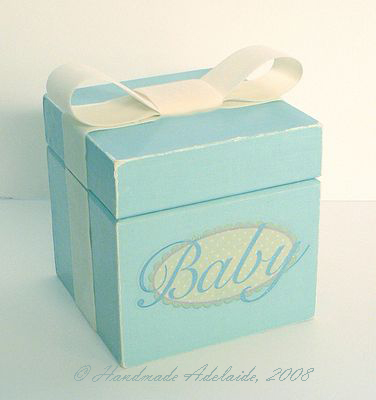 Personalized baby blocks are a great surprise inside the keepsake box. Imagine how cute these will be displayed in the nursery! The baby name blocks, are simple baby shower gifts to make, and use essentially the same supplies. 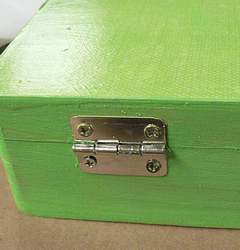 This box craft is SO simple, and uses basic supplies found in your local craft store. You can customize the design to match baby's nursery, and even personalize the box with a monogram or a message on the inside of the lid! 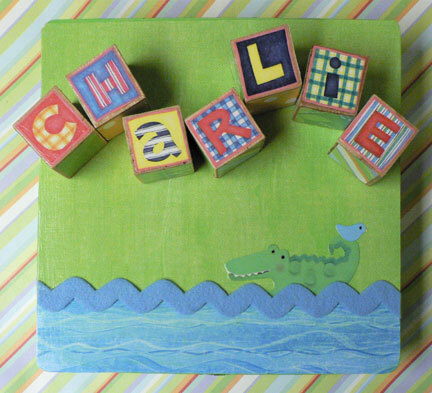 I created a coordinating set of personalized baby blocks for Charlie's room and tucked them inside the baby memory box . ♦Mod Podge Glossy or another brand of decoupage glue. ♦An unfinished wooden box: these come in a variety of shapes and sizes on the unfinished wood aisle, and are very affordable. ♦Stickers and trim to decorate your box: the scrapbooking aisle is a great place to find adorable stickers in many different themes, ribbons, and other cute embellishments. ♦12x12 papers: also from the scrapbooking aisle. I used three designs- a green woven, yellow dot, and blue water. 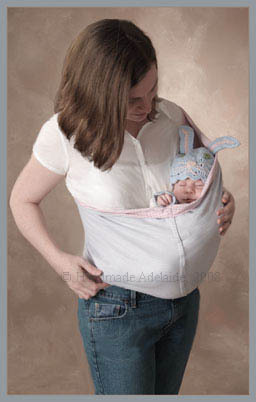 ♦Just for you. . .I made these free baby poems! These pdf printable downloads will add a special touch to the inside, or you may use it as a tag for your gift! 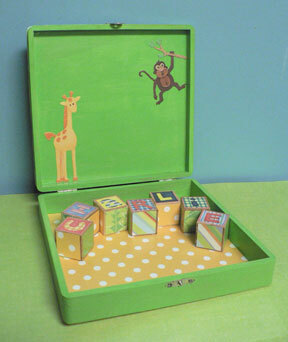 Paint your baby memory box inside and out with acrylic craft paint in the colors of your choice. 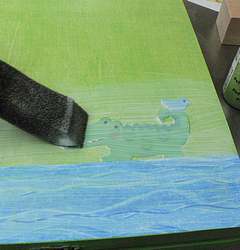 The top and bottom of the box will get covered with decorative paper, but this first layer of paint helps to seal the wood. Allow to dry. Cover the top of the box with decorative paper. I turned a sheet of 12x12 paper face down, and put the box lid on top, tracing around as an outline. Cut just inside outline with scissors or an X-acto blade. 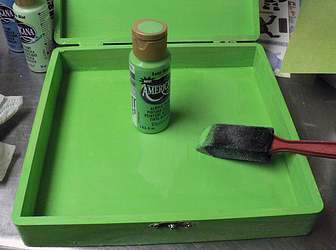 Paint the top of the box with Mod Podge, and carefully line up paper and stick down. Gently smooth and rub out any bubbles. 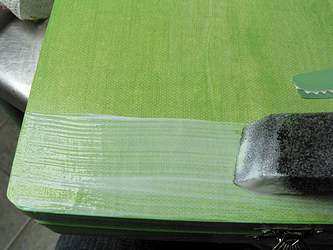 Once the paper is dry, you can trim up the edges with an exacto blade. Choose embelishments for the top of your baby memory Frebox. 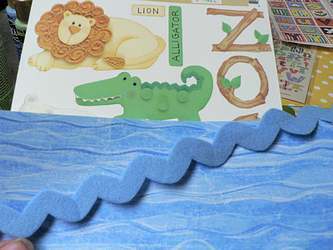 Charlie has a jungle themed nursery, so I chose this cute alligator sticker. 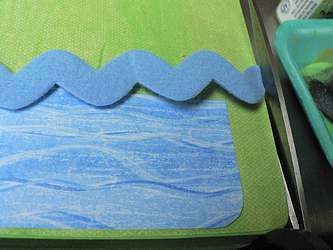 I will use the blue watery looking paper to make a river, and some cute extra large felt rick-rack to make waves and add a little texture. Cut your decorative paper and trim to size. When background paper is dry, apply back layer of scene. I laid down the river paper to make sure of where to stick Mr. Alligator and his bird. I just stuck them on; we'll seal them down in another step. Apply Modge Podge to where your water is going to go. It would have been easier to just apply it to the back of the water paper. . .duh! 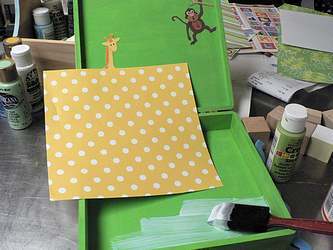 Go ahead and apply all of your paper layers for the top of the box at this time using decoupage glue. When you have all of your paper and stickers in place, seal the top of the box with a layer of Modge Podge. This will give it a nice, shiny finish and protect your decorations from peeling up. 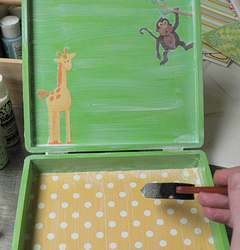 While your lid is drying, go ahead and decorate the inside of your box! I added some more jungle animal stickers to the inside lid. 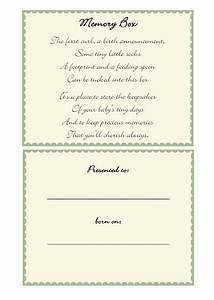 You can add the printable poem above, or any other decorations that you like. I chose a fun yellow polka dot paper to line the bottom of the box. Cut it to fit by placing it into one corner snugly, and then mark where it hits the other three corners. Trim with an X-acto knife and ruler. 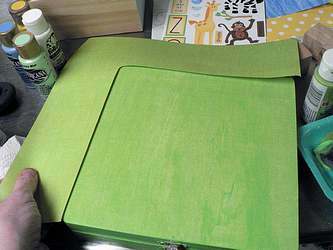 Paint the bottom of the box with decoupage glue, and press liner paper into place. 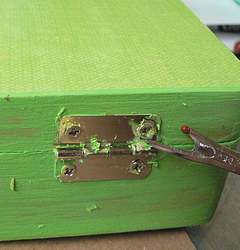 Coat the whole inside of the box with decoupage glue to seal. Avoid the edges where the box will touch when closed if possible. Allow the box to dry really well. It will be dry enough to handle overnight, but it may take a few days for the decoupage glue to fully cure. When your baby memory box is dry enough to handle, you may add any ribbons, fabric, buttons, or other final embelishments. 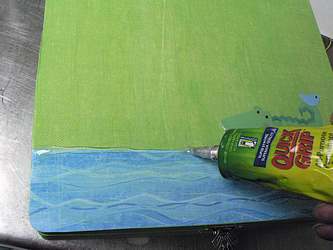 I use Quick Grip glue to apply the felt rick-rack waves to the river. I cleaned the paint off the hinges with my seam ripper to give the box a more finished look.